With regional economic forecasts treading downward, there is pressure for action – but who will step up? As the IMF, G7 and World Bank meet in Tokyo this week, economists and observers everywhere will take stock of the world situation. Whilst there has been some positive news from key areas over the last weeks and months, the overall picture remains bleak, and the months ahead will present many new challenges. The combined meetings come as the global economy struggles to grapple with a still unresolved Eurozone crisis, a sluggish U.S. economy facing several key months ahead, and a China that is facing a slowdown which this week will probably be shown to have run into 7 consecutive quarters. 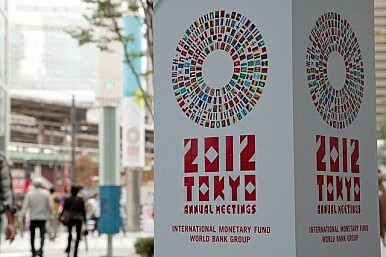 The first came last week when the Asian Development Bank made a large cut to its Asia regional economic growth forecast. The Manila-based institution slashed its expected 2012 annual growth figure for the region from 6.9% to 6.1%. Changyong Rhee, the organization’s chief economist, stressed that it is not just external factors (weak recoveries in the U.S. and the EU) that is causing slower growth. The only small positive in the report was a slight increase in expected growth for the South East Asia sub-region. On Monday, the World Bank then cut its growth forecasts for several Asian economies, most notably China, whose 2012 growth forecast was cut to 7.7% from 8.2% previously. It noted that that there are still fears the Chinese economy could slow further, and these fears were underlined the following day when China’s central bank governor Zhou Xiaochuan, who has impressed many with his financial knowledge and open recognition of difficulties, warned of further downside risks for the country. Hot on the heels of its sister organization’s report, the International Monetary Fund (IMF) lowered its global growth forecasts for both 2012 and 2013 from the levels it had predicted in July. The institution also downgraded China’s growth by 0.2% for 2012 and by 0.3% for 2013 – now predicting annual growth of 7.8% and 8.2% for the two years respectively. India also faced a heavy IMF downgrade, with previous 2012 growth estimates of 6.1% falling to 4.9%, and the 6.5% figure predicted for 2013 being revised down to 6%. The blame for most of these reports can be broadly divided into two areas: External (non-developing Asia) factors and Internal (developing Asia) factors. Externally, the world’s largest market (the EU) continues to suffer from the Eurozone (EZ) debt crisis and weakness in non-EZ member states such as the UK. The United States had some good news recently with stronger than expected employment data, but much of the hope there is tempered by unknowns about the looming “fiscal cliff” – the politically difficult problem of a combination of automatic budget cuts and the expiration of various growth supporting fiscal measures both of which will occur at the end of the year. In other words, the developed world is still stuck with the fallout from the Global Financial Crisis. Internally, developing Asia is battling with two main issues: the slowdowns in both China and India. It is still not entirely clear if China’s slowdown is the opening act of an economic phase shift and rebalancing (which depends on political decisions in Beijing). For India, political paralysis and what ADB’s Rhee called “…a failure to push through promised reforms” are hurting economic development. The AIIB and the NDB: The End of Multilateralism or a New Beginning? Should the West be worried about new competition in the global financial architecture?